2. Take photos with HD. Equipped with a tripod/mobile phone photo clip, it can be used to take photos with the mobile phone. It is suitable for the current mainstream smartphone model (it is recommended to match the mobile phone with 6 inches). 3. Hold the focus in one hand. It can be adjusted by single hand to adjust the focus wheel, easy and convenient quality material cylinder body weight is moderate, bringing a more comfortable grip. The size of the objective lens determines the amount of flux, our telescope objective diameter up to 42mm better light, which is better and the details are more powerful under dark light. 1.Keep the lens covers (that come with your binoculat,except compact type) on the lenses when binoculat is not use. 2.When wiping thelenses,use the lens cloth that comes with that binocular,or a soft,lintless cloth. 3.To remove any remaining dirt or smudges,add one or two drops of isopropyl alcohol to the cloth. 4.Store your binocular in a moisture-free area. 【Wide field of view】: FMC multi-layer enhanced green film increases light transmission for brighter and higher-contrast images. 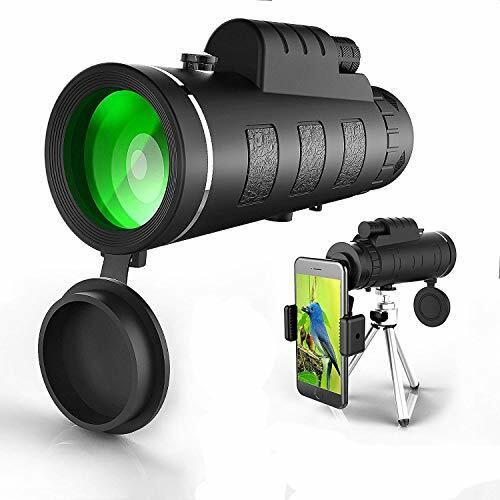 【Adjustable Tripod and Phone Clip】This telescope allows for many different viewing positions with a adjustable tripod, Single hand operation: lightweight and compact, easier and more convenient for outdoor using. 【Unique Convenient Design】 Unique anti-slip design keep it from slipping out from you hand; Adjustable eye cup can be easily and quickly twist up and down for optimal viewing even without glasses. 【 Durable to use】: rubber coating protects the body from impact and wear. - Further distance vision: the farthest visual distance can up to 9500m, it is 20 times further than other ordinary cameras. If you have any problem when use,contact us directly please. View More In Night Vision Monoculars. If you have any questions about this product by Vantax, contact us by completing and submitting the form below. If you are looking for a specif part number, please include it with your message.